Care2 Causes | Trump Is Our President Elect, So Now What? 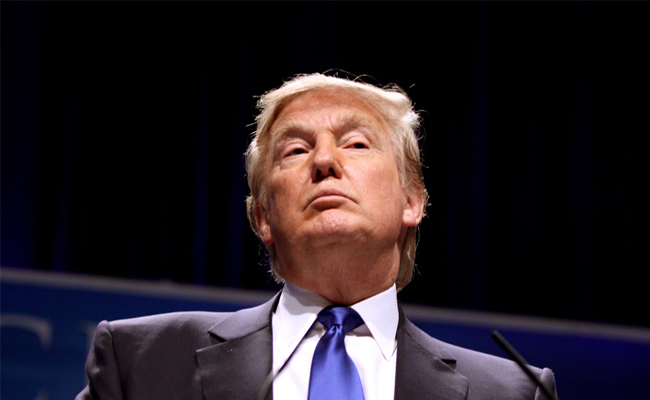 Trump Is Our President Elect, So Now What? I’m heartbroken over the election results. There, I said it. So this is an opinion piece for sure. But I’m not going to dissect how we got here, or conjecture about the plethora of reasons why Trump as POTUS really is that bad. There’s more than enough of that to go around. It practically writes itself. Instead, I’d like to share some suggestions about how the majority of us can move forward, and hopefully — come out stronger than ever to bring about the changes we seek. For those under rocks and such—since Trump won the electoral election, thousands of Americans have taken to the streets in protest. To many people, Trump represents the voice of hate. From coast to coast, people in both red and blue states have demonstrated in response to the POTUS decree. Some turned violent, but the majority remained peaceful. I would laugh if that comment wasn’t so terribly sad, not to mention ironic. He is, after all, the quintessential master media manipulator. And “open and successful election”? I thought it was rigged, Mr. Trump. Which is it? Americans have the right to free speech. We have the right to assemble and voice our opposition. And what those protesting are doing (minus the violent few) is exactly what our country needs more of. So get ready, because this is just the beginning. We are many, and we are strong, and we have power. This is not over. It is just beginning. For those who believe there’s still a chance to oust Trump before he takes office—more power to you, and I mean that. But as much as it pains me, I’ve chosen a different path: acceptance. Like it or not, Trump is next in line POTUS. And the sooner we accept that, the sooner we can get down to business. Does that mean we should accept Trump’s leadership by blindly following along? Hell no! Trump may be president, but he doesn’t speak for me, and that doesn’t make me a sore loser or un-American. After the election, President Obama spoke about Americans being all on one team. I respectfully disagree. We are all one country, yes. But the team I’m on believes in climate change, that women are not objects, and that people should not live in fear because of the color of their skin, their religion or sexual orientation. Speaking of the smooth hand off from his presidency to Trump’s, Obama also spoke about how Trump seems to understand that it could go a long way toward showing the country a sense of inclusion “and respect for each other” as countrymen. Remember when Trump called Obama “the founder of ISIS.” How can we forget that? Here’s the thing: Respect is earned. Trump has not earned mine. He’s said many disturbing, hateful, derogatory remarks about my fellow Americans, and I don’t respect that. So while I accept the reality that he is to be our president, I don’t respect him, and that also doesn’t make me a bad American or a bad sport. Perhaps if Trump spends the next four years apologizing for all of the insults he’s flung at so many throughout his campaign, well, that would be a start. I get that they’re trying to be polite during a transition of power, but calls to unite behind a man who ran such a divisive campaign are insulting. It’s audacious to ask America’s women, immigrants, Muslims, blacks, LGBTQ, etc. to throw their support to a man who made a point of demeaning and excluding them in his campaign. Speaking about Democratic leaders, Mathews said, try as they might, they are not going to convince many progressives to “respect” the next president. That electoral map image is engrained in my memory. 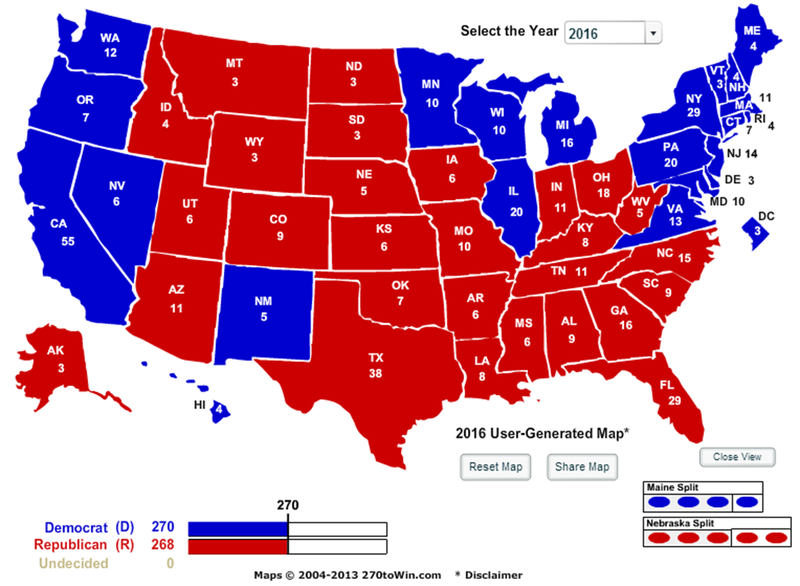 New Mexico notwithstanding, it looks like an unsavory blue sandwich with way too much red meat smack dab in the middle. That’s the country we live in. Not only do we need to accept Trump as our next president, we also need to wrap our heads around the fact that we live in a divided nation. I’d be lying if I said I wasn’t scared about the next four years. I’m scared for my Muslim and Latino friends. I’m scared for my LGBT loved ones. I’m scared for women and people of color. I’m scared for my planet and the animals on it. I’m scared for so many reasons. Some Trump supporters celebrated by committing hate crimes. A Ku Klux Klan group in North Carolina is planning a rally to celebrate Trump’s election victory. That’s scary stuff. I will rise up and make my voice heard. If I see someone being mistreated because of the color of their skin, or their religion, or where they are from — I will bear witness and stand with that person. Their safety is my responsibility. No one person can make or break this country, just as no one person can determine another person’s joy. It’s up to all of us to determine what tomorrow brings. If you share my heartbreak about the election outcome, once you’ve come to terms with the shock of it all, do whatever you need to do to accept it. And then, and this is crucial– let yourself feel sad. It’s the healthy thing to do. And finally—prepare to rise up, stronger and louder than ever before, as many times as it takes to help make our country be what it can and should be–a place where all people are treated equally and feel safe. I don’t know about you, but I don’t want to just survive the next four years. I want to thrive. I want the same for those I care about. The question is: how do we do that while Trump is President? I do believe it’s still possible, but it will require us to work smarter AND harder than ever before. It’s time to turn the volume up on our voices. Whether it’s passion or purpose, the lesson is the same: we are all powerful. And I would add—even more so together. So if you’ve never been to a protest before—step outside your comfort zone and join one, or ten. Bring the kids. Have you ever started a petition? It’s easy and effective. The next four years is your time to shine and to speak up for what’s important to you. It’s also the perfect time to teach your children to do the same. Trump may be president, but we the people have a voice. Let yours be heard. Create a petition: There’s no time like the present. It’s easy to start a petition and get people to add their voice to your call for change. Trust me–they work. Read this: Care2’s Julie M. Rodriguez lays out 10 things you can do right now in response to Trump’s victory. And now, in action, we see that things are only getting worse. Trump is a criminal psychopath, he's 100% clinically psychotic. What does that mean? He has the exact same personality as Ted Bundy, the ISIS leaders, Boko Harm, Hitler. Stalin. The first people he will massacre, like Stalin did, is his zombie like, brainwashed, fail in life suckups theTrumpanzees. Because they're sucking up the closest to the 70 year old heart fat dripping attack victim, Psycho Orange Clown, and since Trump is in terror of everyone around him he will reward them by killing them, especially if he thinks he can get away with it and it's profit for him, or just for kicks. Trump naturally being the psycho that he is, is calculating every minute how he can destroy America. That's a delicious thought for him. He gets off on committing felonies and being able to get with that scot free which is what he has done all of his career felon life, and now he can go beyond that and commit acts of global terrorism which make ISIS look tame. ( 1 million to NY for fraudulently caling his scam a "university"
for defrauding them with false claims ). 4. Cited repeatedly for abusing funds meant for charity. 6). defrauding investors with many bankruptcies. 8) giving an illegal donation to a state AG who was considering investigating Trump University. 9) Using junk bonds to finance his AC casinos, after the Gaming commission told him not to. 10) getting partially bailed out by his Dad via an illegal gambling ploy. Trump will cut taxes mostly for the wealthy and cut benefits for social programs. Trump will fund the military and then start wars against anyone who dares to stand up to our new Hitler. Putin will be his ally. Putin will have a green light in Syria and in Europe. Trump will control all of our democratic checks and balances - the House, Senate, SCOTUS, the press - by intimidation. After getting control of our democracy, he will change the constitution and remain in power with sham elections controlled by his goons. All you have to do is study how putin has pulled this off in Russia. Now, trump will have putin assisting him. He will round up and imprison anyone who does not cooperate with him. He studies Hitler extensively. And he rules by an Iron Fist as his middle class supporters are long forgotten. Turn 9/11 around and you get 11/9 the date that fuhrer trump was elected. A trump presidency is worse than 911. The 911 tragedy brought us together. This tragedy will threaten our democracy. Trump wants to be a putin-like dictator. Trump will continue to give Hitler-style rallies in red states. Anyone not part of trumps white, straight 'army' will be intimidated and threatened with violence. Its great to haver dreams......but you MUST have a realist to actually make the idealists view happen. I am not whining about the election Brain.....YOU are. I didn't have sour grapes about it you do.I am not stomping around like a child YOU ARE. ALL I did was point out why we lost. WE DIDNT TAP THE SAME GROUP AS BANNON AND TRUMP. It was a huge mistake. Trump played that group like a violin. We didn't. So we lost.